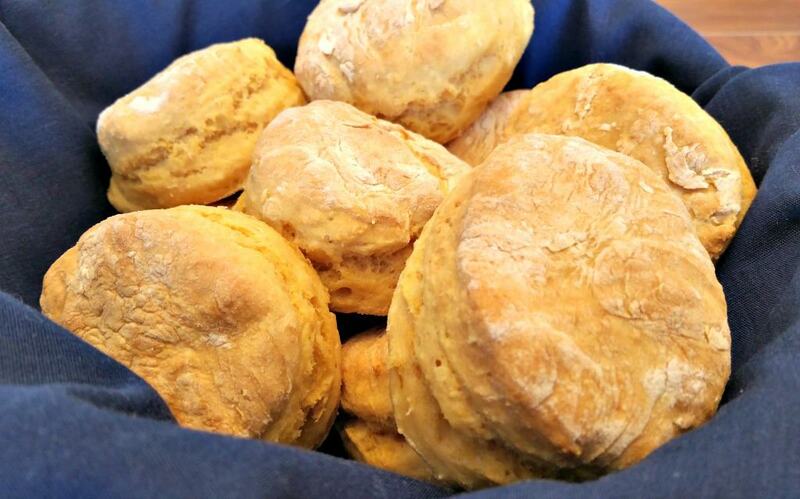 Who doesn’t love a piping hot, Vegan Buttermilk Biscuit, right out of the oven. Maybe with a dab of jelly that oozes out the sides as you close it up for that first bite? Or a smear of Corn Butter? Mmmmm. Or sometimes you just need something to sop up a bunch of gravy or stew…..
Yeah…. I said SOP…. it’s a southern thing. It means using this hot, flaky biscuit to soak up as much gravy as possible so I can bring it all up to my mouth and devour it… nom nom. Well let me be perfectly honest, the recipe I used to make had vegan butter as an ingredient. And although vegan butter technically IS still vegan – it’s still nothing but fat. Oh they tasted good, no doubt about it – but not quite as healthy as I would like, especially if I was going to post a recipe here for you to try. So I opened up my fridge and the answer was right in front of me. I was a little hesitant it would even work at first but the results were…… well look at the photos…..
And what is this secret ingredient? Why veggies of course, making these quite possibly the healthiest vegan buttermilk biscuits out there! I’ve ranted and raved before about my Vegan Cheese Sauce, made out of potatoes and carrots. If you haven’t tried it yet you are really missing out. This stuff is nothing short of amazing AND it makes the perfect filler for our vegan buttermilk biscuits. Ready to bake some awesomeness? If you don’t already have some of this Amazing Cheese Sauce sitting in your fridge (shame on you), you are going to need about 1/2 cup, so go whip up a batch of this first. Don’t worry, it keeps and trust me your leftovers will not go wasted. Ok, on to the biscuits. Start by measuring all the dry ingredients into a large bowl. Then add in 1/2 cup of the Cheese Sauce. I used a dry ingredient measuring cup and made sure it was all squished in there tightly, so it was a full 1/2 cup. As you stir this in with your fork, you’ll see it will start to make crumbles, just like cutting in a stick of butter would do. Meanwhile pour 1 cup of plain, unsweetened, Almond Milk into a Pyrex measuring cup and add 2 teaspoons of Apple Cider Vinegar and give that a whisk. This is our Vegan Buttermilk. Let it sit for a minute or two and it will thicken. Now using a wooden spoon, slowly stir the buttermilk into the flour. Only stir enough so the dry ingredients get moistened. Don’t go crazy stirring too much. 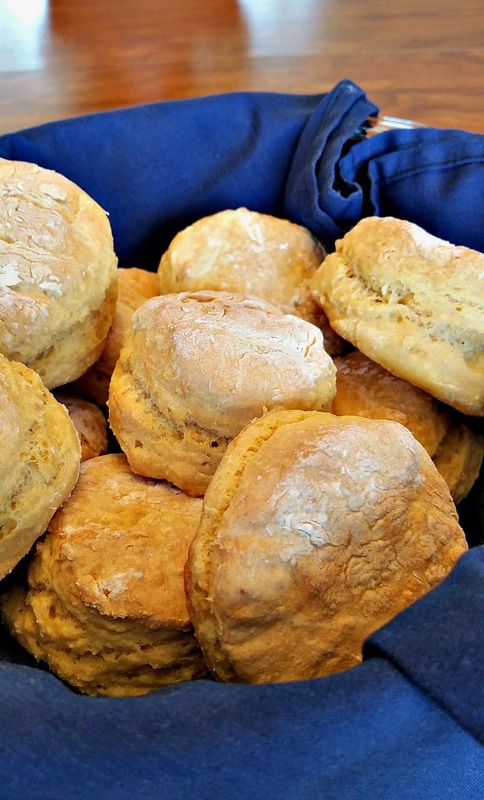 This is one of the secrets to fluffy biscuits….don’t over mix! At this point you can drop spoonfuls of biscuit dough onto your parchment lined cookie sheet for drop biscuits (just like grandma used to make) OR you can use a biscuit cutter to make those perfectly shaped biscuits I like so much. If you want to use a biscuit cutter, spoon your dough onto a well floured work surface and give it a quick knead, just a few times will do. Now roll it out to about 1″ thick and use your cutter (or any cup will work) to make perfectly round biscuits. Place these on your parchment lined cookie sheet so they touch each other (another secret to fluffy biscuits). Bake in a 450 degree oven for 15 minutes or until golden brown. One batch of dough gave me about 12 biscuits. Spread on a little of that left over Cheese Sauce or homemade Jam. One of my favorite dinners is to top off a couple of biscuits with some veggies and gravy. 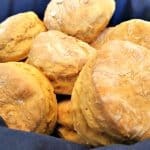 With no butter, eggs, milk, or oil these may quite possibly be the HEALTHIEST Vegan Buttermilk Biscuits around. Roll out dough to 1" thickness and cut circles with cup, glass, jar, or biscuit cutter. Adapted from Minimalist Baker and their incredible Best Damn Vegan Biscuit Recipe. Chuck … I am in biscuit nirvana right now . It is soooooo delicious and light and fluffy! Thank you from the bottom of my Southern vegan heart for this recipe!!!! These biscuits were so fantastic! One of my sons said a 10 rating Another son said maybe better than regular biscuirs! Thank you! I don’t know what I did wrong, but the dough was so sticky It was near impossible to roll out. I did the best I could and put on top of the pot pie. They were not flakey at all! I use glass Pyrex Measuring Cups for all my liquid measurements, and plastic measuring cups for all my dry measurements. I also used Bread Flour. Just add more flour next time and it should come out fine. I had to use 3 cups of flour. It probably depends on the humidity. Yay! Biscuits are back on the menu, thanks to you! I love that you found another way to use your awesome cheese sauce. Brilliant! I did need to use 3 cups of flour (same brand as yours) to be able to roll and cut the dough. The amount probably depends on the humidity. Thanks for another great recipe! Would these work with white whole wheat flour? I don’t know why not. Give it a shot. I made these the first time with whole wheat flour and I liked them better with the white flour but I think I also used too much of the milk the first time, too. Next time I will try a combination. How much gluten free flour do you recommend instead of bread flour? These are amazing, my omnivore husband even liked them! I believe the problem everyone is having could easily be fixed Chuck if you put in your recipe directions a sentence that appears in the article. That is you don’t need to add the full cup of buttermilk, just enough liquid to make it into a dough. Just a thought. Like abbeygirl says, the recipe needs to say not to add all the buttermilk, just enough to make a rollable dough. Pretty good. Just a little gummy. I used the cheese sauce in it’s solid form and used a fork to blend it in the flour mixture. I made them as drop biscuits. I’d make them again. These are really good! I actually put some salsa in the cheese sauce, heated it up and poured it over the biscuits. My husband put maple cream and jam on his. Can you use rice, soy or oat milk in this recipe instead of the almond milk? The best vegan biscuits are made with water not any kind of milk! Really plain ol water? Can I make the sauce ahead of time? how long does it keep in the fridge? I have had the sauce in the fridge for at least 1 week, but it doesn’t usually last that long because it is sooooo good! I made my sauce 2-3 days ago and made the biscuits tonight, turned out wunnerful. So excited to try these! Thanks so much! Just made the biscuits and they are wonderful!!!! One thing though, I rolled mine out to 1″ and there’s no way that would make 12 biscuits. Did you just estimate? 1″ is pretty thick. I ended up doing about 1/2″ and it made 15 biscuits. Or maybe I did something wrong. These are yummy! I usually use applesauce to replace butter in my biscuits but this cheese sauce takes them to a whole new level. Great with Happy Herbivore’s mushroom gravy. Thanks for sharing! P.S. I used oat flour to make them gluten free. Blessings on your vegan journey. Aren’t we dint with the fear of fat yet? It’s kind of essential for proper brain function. We can avoid animal fat very easily, thank goodness. It’s not healthy to eat added fats. The essential fats should be absorbed by eating whole foods such as avocado, nuts, seeds etc. Animal fats are the worst, but any pure fat isn’t good. No one here is afraid of fats, and give me an avocado and I’ll tear that baby up. and take it with the fiber and nutrients that are also found in that whole avocado,. I left a comment a year ago on these biscuits. I am still making them!!! They are sooo delicious!!! I usually make the cheese sauce the night before I make the biscuits so it has plenty of time to chill. I also don’t add all the ” buttermilk” so There is no need to add additional flour. 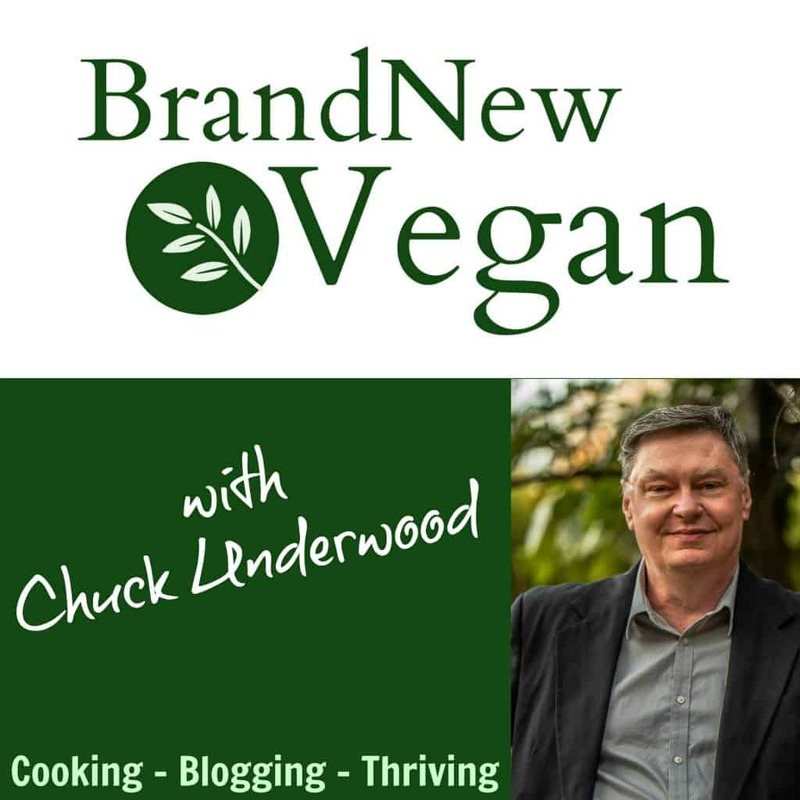 Thank you Chuck for continuing to share your delicious recipes! ?? Has anyone ever frozen this cheese sauce before wth success? Yes. In fact, if you let it thaw a little bit afterwards you can grate it like block cheese too. Perfect for pizza night. Oh my gosh… That sounds amazing!! Thank you Chuck for your response and yummy suggestion for grated “cheese”. Looking forward to trying that! I tried this today and was never able to get the mixture to become dough. I used Bob’s Red Mill gluten free all purpose flour and added probably a cup or more than the 2 cups to try to get it to dough. I also used homemade cashew milk instead of almond milk. Should I try again with less buttermilk? Mine never get to the point where I can roll them out so I just scoop 12 mounds onto parchment lined cookie sheet and we’re pleased wth the results. You used the wrong flour. The flour wasn’t the issue but thank you for your helpful answer. I made them again with less buttermilk and was able to get it to roll out. They did not fluff up real well which I’m sure is because of the flour. However, the issue of it being too runny was not the flour. But it doesn’t matter because I probably won’t make these again. If I do, I’ll use Bob’s Red Mill gluten free bread flour. using Domoata flour you will get best results- it has already in it the GF way to rise as gluten does in typical items. I made these yesterday and followed the directions carefully, including chilling my cheese sauce. I’m trying to get my husband to see how good fat free can be but they baked up like hockey pucks. The one thing I did differently was not bake them right away. Maybe several hours later, I refrigerated them until I baked them. Any ideas why they didn’t rise up? My baking powder and baking soda are fresh also. Thanks for any ideas! I would like to try again with these. Ok, so I made them again and they are great. I used lemon juice to replace the apple cider vinegar because I didn’t get any thickening of the milk the first time. The lemon juice worked well for me. I also substituted white wheat flour and worked just fine. I baked them right away as you suggested and I have flaky biscuts this time. Thanks so much. Anything that requires baking soda should be be baked as soon as the dry ingredients are combined with the wet. Same with baking powder, except that “double acting” reacts not only to liquid, but also to heat, hence, the name. I do it every time. I forget to read the comments before trying the recipe. Oh yeah, I had a gooey mess on my pastry mat. I used a spatula to get the dough off the mat and drop onto the parchment paper. Oh yeah, I didn’t exactly let the cheese sauce cool completely. I DID make sure they touched! And then I baked them for 15 minutes, left them in another 3 minutes with the oven off. I just had one with jelly. A.MAZ.ING! So sure, I’ll be tweaking things here and there. But I can’t wait to make up the gravy tonight, cause it’s biscuits and gravy for dinner! Thank you Chuck!! great biscuits! Have you ever done the nutritional data? Can anyone tell me where the cheese sauce recipe is? Follow his link (the colored words for cheese sauce), or look for his mac and cheese recipe. It’s part of that recipe. 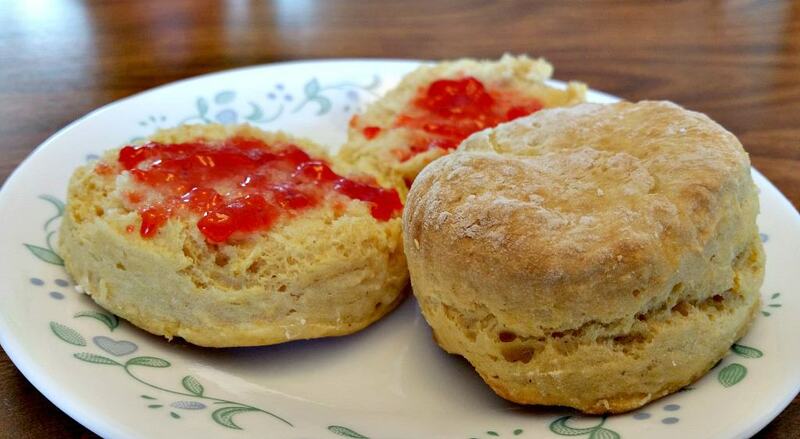 Fantastic… used the drop biscuit recipe, since my batter was a bit soft, but no disappointment here… turned out great… Moist, good texture, tasty, easy to make, everyone likes them… what more do you need in a recipe…. Tried these biscuits this morning. Amazing! Thanks for sharing. These are great! Even my picky teen approved! These would also be good with your corn butter recipe!!!! This recipe changed my life. Thank you! Oops. I missed the parr about chilling the “cheese.sauce”. First batch made per instructions (except chilling cheese) and had too. 2nd batch, I used 2/3.c milk. Still gooey. Next batch I’ll know to chill the sauce. Yum! Just got them out of the oven! What a treat! So glad I had some leftover Amazing Vegan Cheese Sauce. Perfect! Wow, I made these biscuits for the pot pie recipe. Absolutely worth the efforts of the cheese sauce. I coulda easily eaten the entire batch. A HIT for me! I never comment on any recipes. I flung these bad boys together in a jiff, and let me tell you these are the best biscuits I have ever had. Just in time for strawberry season and the fresh strawberry jam I made. 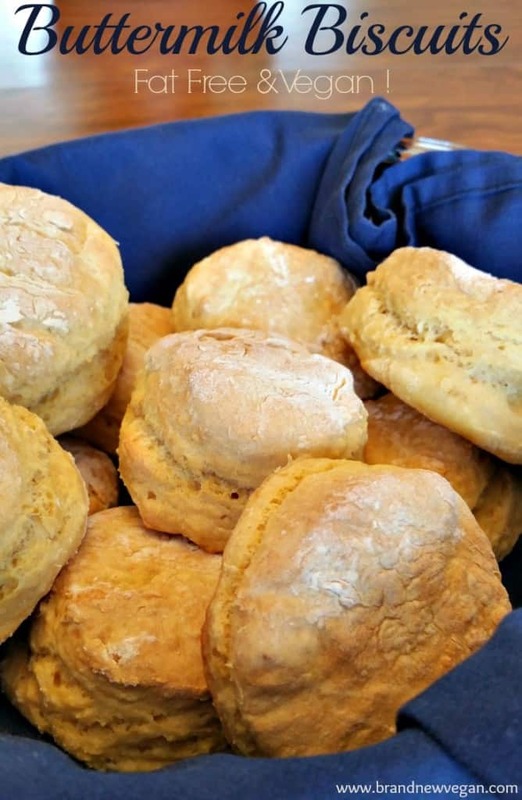 Will be making these biscuits for all future biscuit cravings. Love love love them. So glad I chose to use this recipe. Has anyone tried using sourdough in these and if so what were your results? Does the cheese sauce add a flavor? I am trying to do something more like strawberry shortcake…. Just wandering/concerned how well these would fit into to dessert file?! Thanks!! The cheese sauce replaces the fat, shortening, or butter usually used to make biscuits. I just made these, and WOW! Everyone loved them. This are my new favorite vegan biscuits. I ate mine hot from the oven with jam. YUM. Thank you for your creativity! My dough was a bit sticky too, but I just added some more flour to roll it out. So fluffy and delicious! I use 4 Tbls of mashed banana in place of the cheese sauce and only 1/2 cup milk with 1 Tbls vinegar, then add more milk if needed. They come out wonderful, with a hint of sweetness. How are these compared to you potato biscuits which I LOVE?